Naija Writers’ Coach is an online writing forum with the mandate to provide free daily information on essay competitions and practically help YOUth attain proficiency in essay writing. 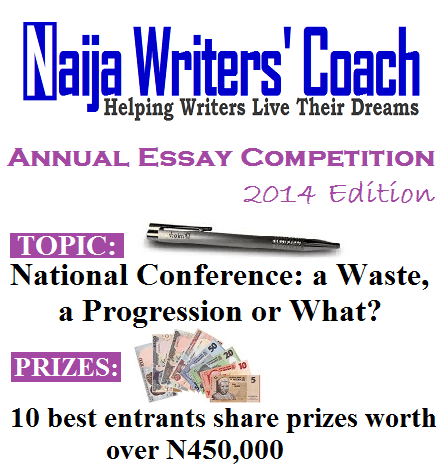 Submissions should be made through the form on the Naija Writers Coach official web site (link to it is below). Submissions by email would not be accepted. Each entrant must ensure that his/her essay is free from plagiarism.The deadline for submission of entries is 20th April, 2013 (by 11:59pm) when the submission form will be taken off. All essays received and which are publishable would be posted on the Naija Writers’ Coach website (link to it is below) between 21st April and 25th April, 2013. On the 24th May, 2013, the 3 winners would be announced. Winners would also be notified by email.